It is another busy day in London, and it is not supposed to rain until this afternoon, so what better way to spend a morning than to see if I can catch a glimpse of the Queen. Unfortunately, Prince Philip is in hospital and will not be able to join her today, and I am sure he will be on her mind most of the day. It is a shame he can’t be there to share all the special events with her. 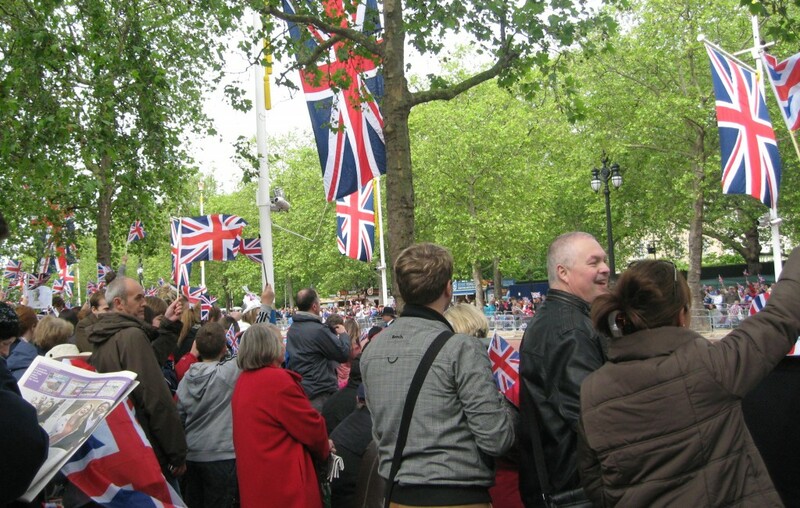 I wandered down to the Mall and glued myself as close as I could to the railing with many others to wait for the Queen drive by on the way to St. Paul’s. Massive, friendly crowds...again. Photo by me. 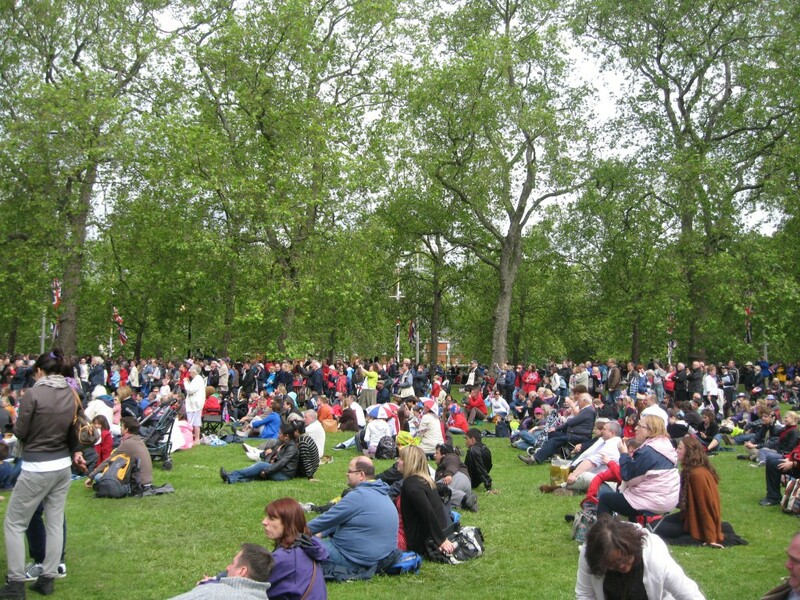 The crowd, as always was in a splendid mood and burst into song “God Save The Queen” and “Rule Britannia” at a moments notice. 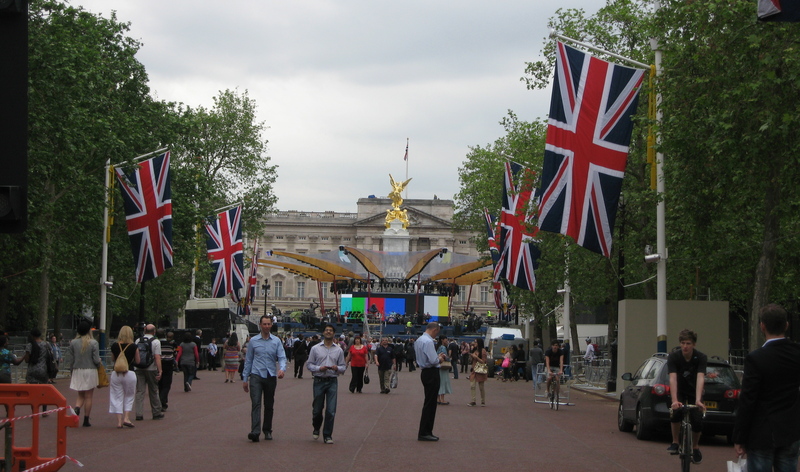 There were two groups on either side of The Mall that often broke into a cheering and flag waving competition. All very high-spirited and fun. And I did manage to see the flash of pale blue as The Queen drove by following the car with Prince Charles and Camilla. 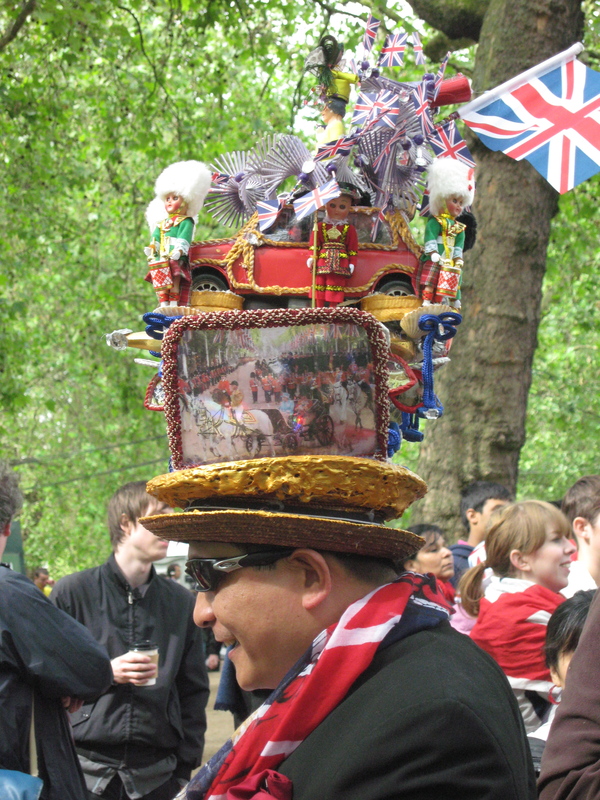 It was actually pretty exciting, and I must say, I have a sense of satisfaction that I have seen the Queen in her Jubilee Year. There was something poignant about her sitting with her Lady in Waiting, The Lady Farnham, rather than Prince Philip, but she was still all smiles when she reached St. Paul’s. You’ve got to love this woman. She just keeps soldiering on. 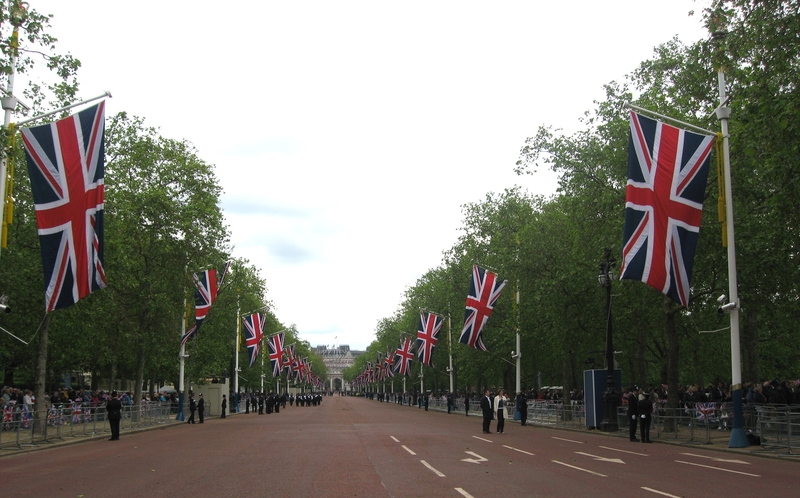 The Mall and St James's was filling up fast. By 12:30 when I passed it again, they had stopped any additional access. It was full. Photo by me. …and then headed back to pack up and head off. I had to get to Charing Cross Station which was right in the middle of all the motorcades winding back and forth throughout the day. This was going to be interesting. I passed streams of people heading to the Mall to see the procession and appearance on the balcony later this afternoon. And so I am off to Kent today to meet up with My Beloved Brit. 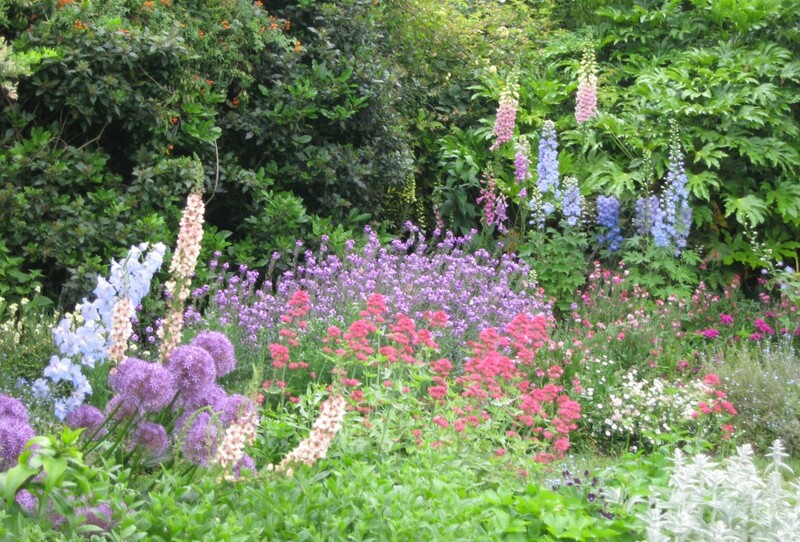 He has promised me a day or two of magnificent garden tours if weather permits before we enjoy the company of some of his family we haven’t seen in ages. The perfect way to end a perfectly wonderful Jubilee Celebration. Walking through London, the images are overwhelming. Everyone is in a tremendously festive mood and in such good spirits that it’s bound to rub off on you. 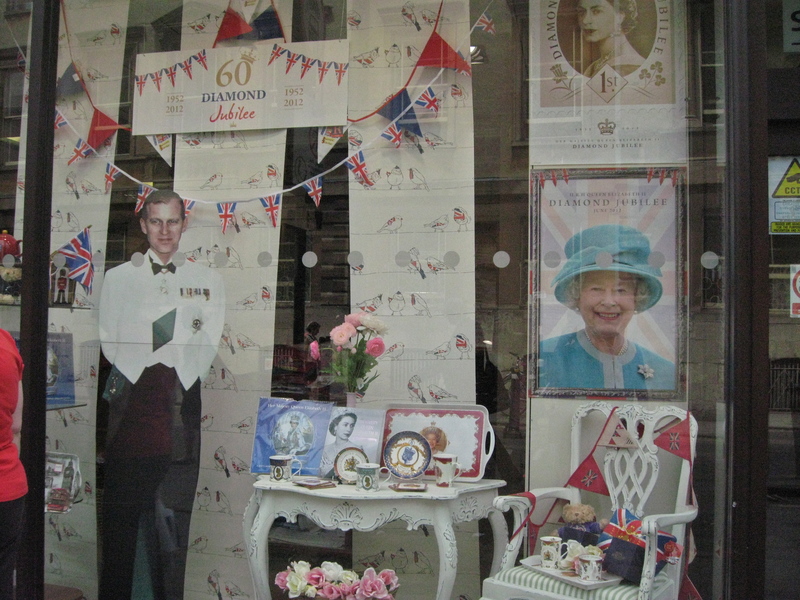 The town is ready for the 60th Anniversary of the Queen’s reign. 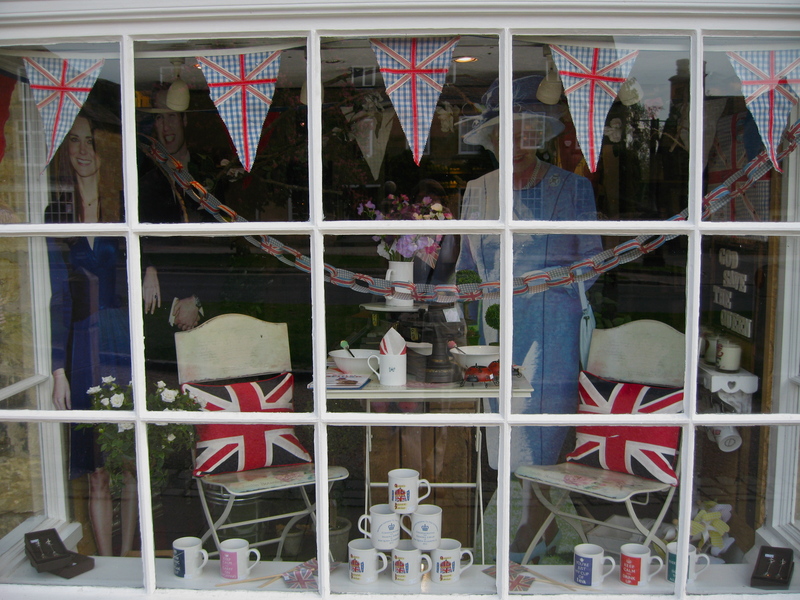 A sweet window decorated with the Queen in mind. Photo by me. 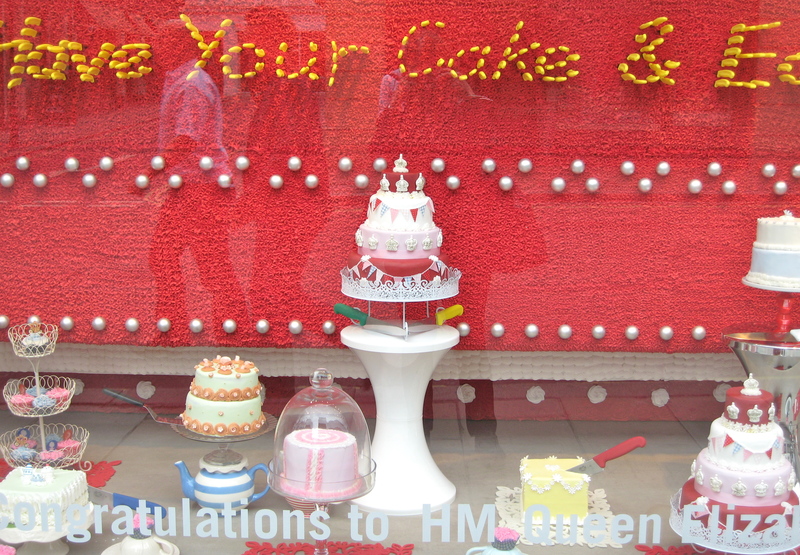 I thought today I’d share some of the London sights on the Friday before the weekend Jubilee Celebration really begins. As soon as I got to London, I could see there was a party going on. 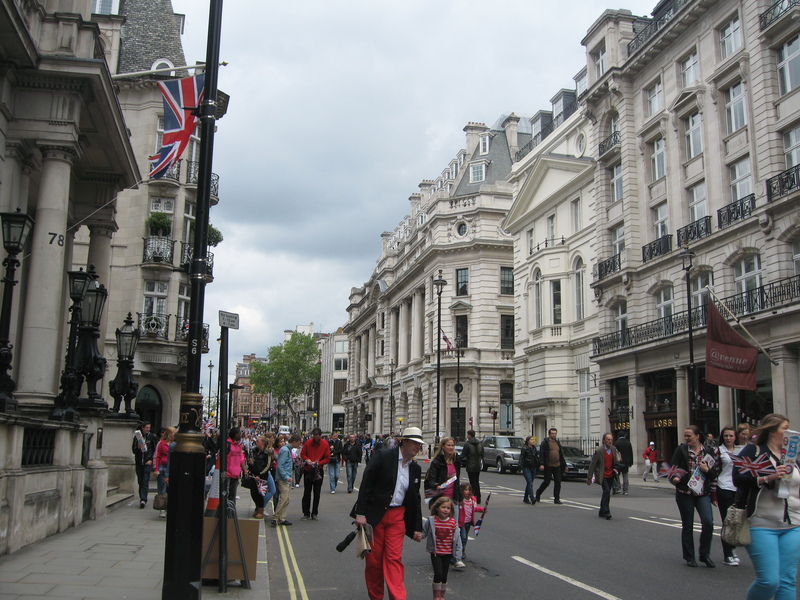 Photo of Bond Street by me. 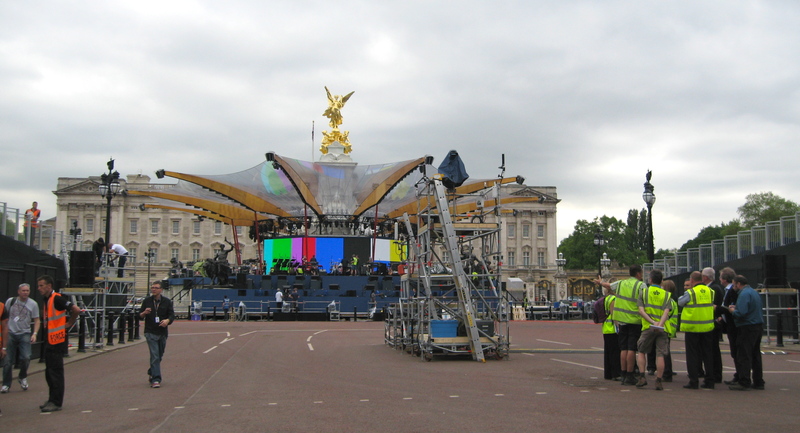 Getting ready for the concert on Monday night at Buckingham Palace. Photo by me. 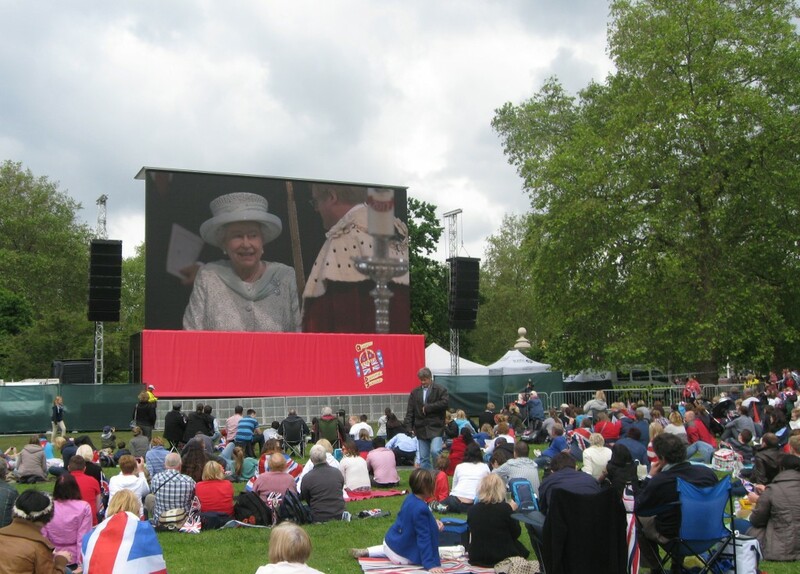 I wandered over to Buckingham Palace to see what was going on in preparation for the big weekend. The bands were beginning to rehearse and there was great music playing. Have no idea who was playing it, but it didn’t matter. I’ll walk down a few more times before the actual night of the concert to catch the rehearsal music. The crowds are manageable now, and I have a feeling they won’t be on Monday night. 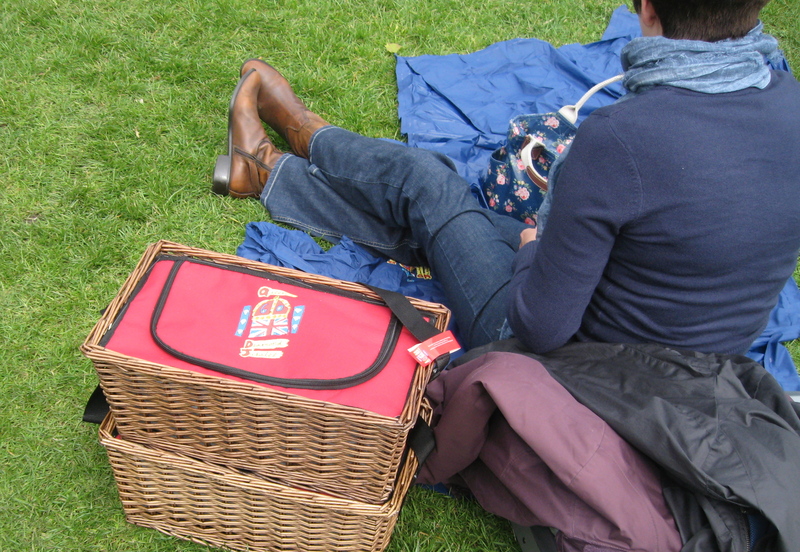 Luckily my accommodations are a short ten minute walk through Green Park. The Mall is pretty much shut down to traffic getting ready for the big event. 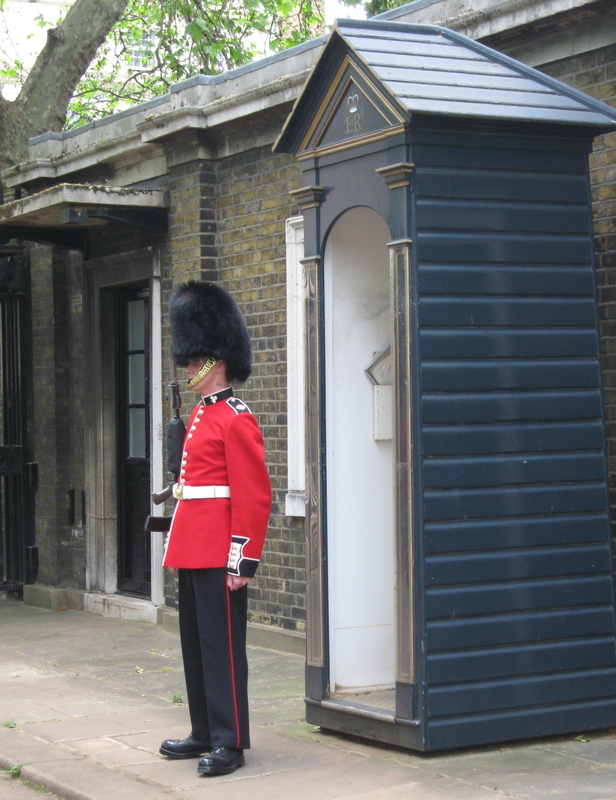 But the guard at Clarence House directly off the wide boulevard doesn’t seem to be aware of all the commotion around him. 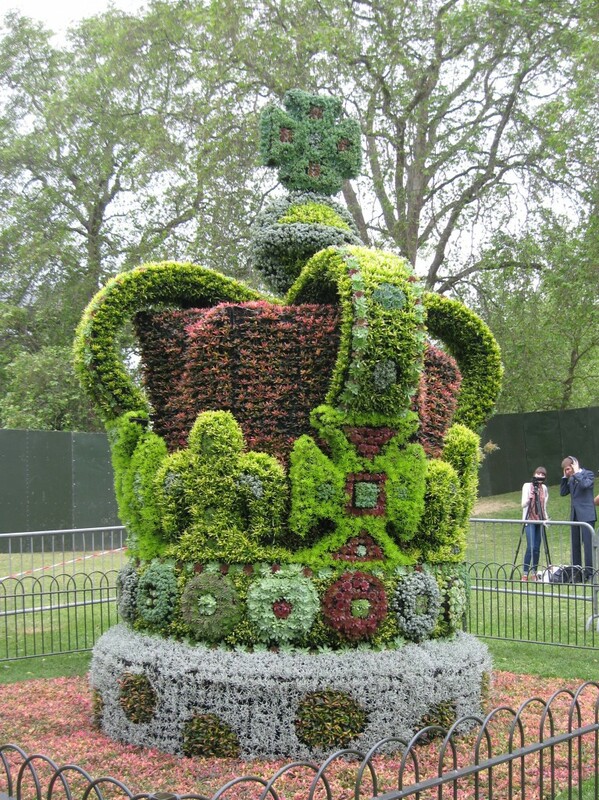 …not to mention the most gorgeous gardens in full bloom (nothing to do with Jubilee. I just thought they were spectacular). 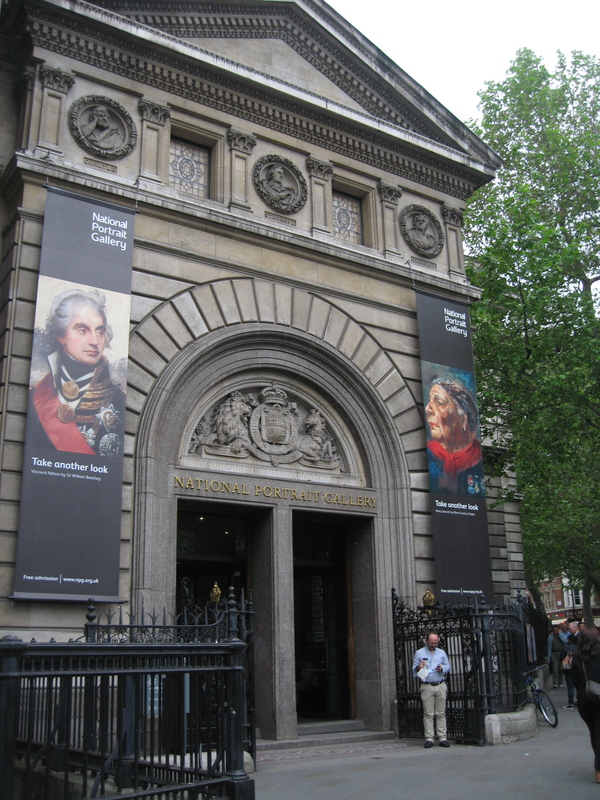 I left the excitement surrounding the palace, and headed over to the National Portrait Gallery to see the exhibition on the Queen. Well worth the walk. There was a special exhibit featuring six decades of art portraying Elizabeth II. 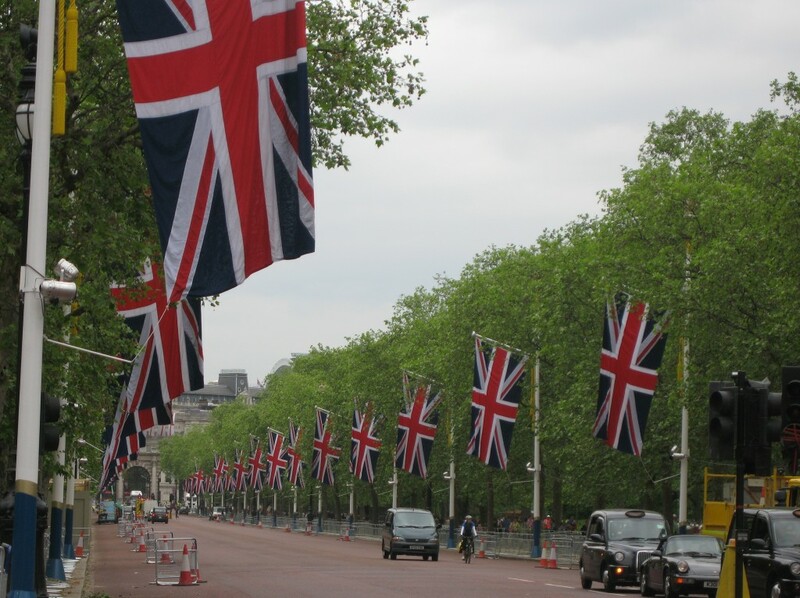 As I came out and turned to walk back to my room, I noticed the Canadian Embassy, decked out in honor of the Queen. Congratulations, your majesty. Job well done. 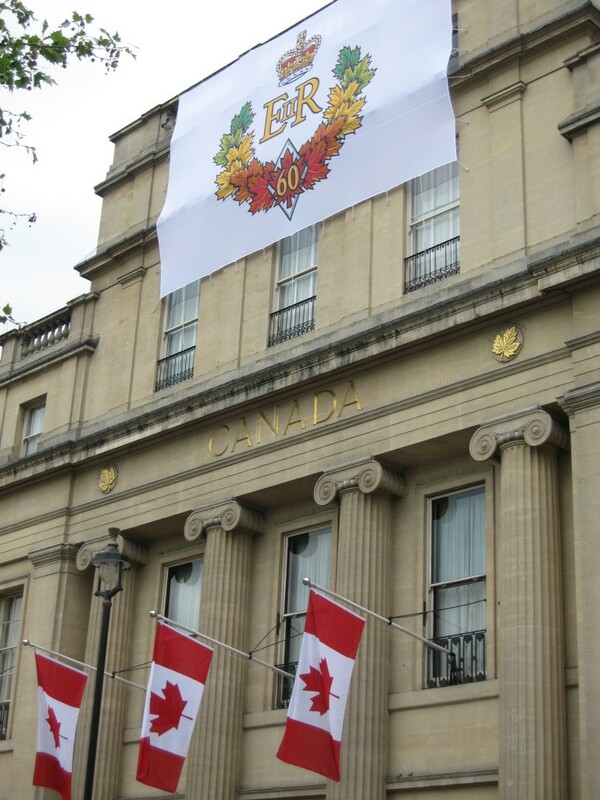 The Canadian Embassy honors the Queen. Photo by me. 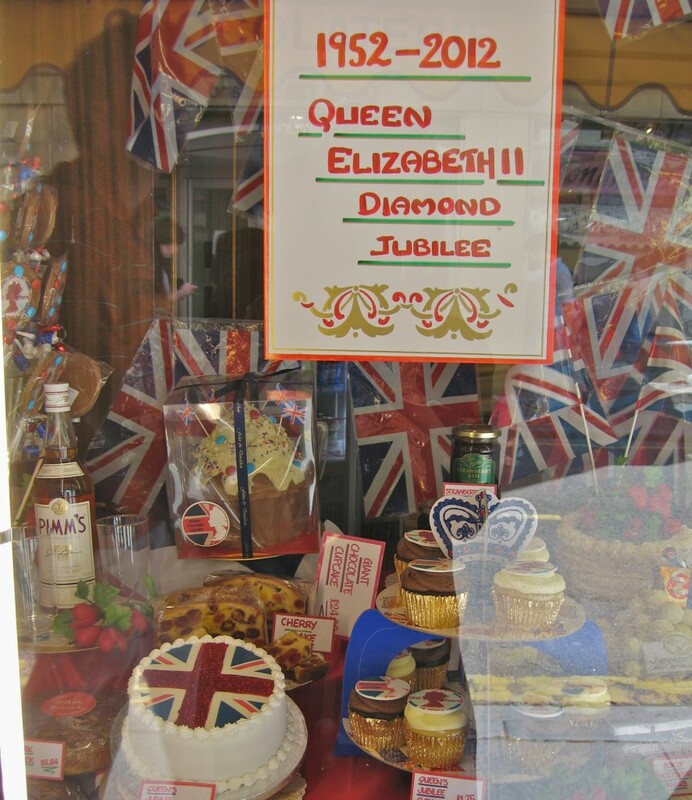 Wherever we went in England and Scotland this past week, we saw store front windows celebrating the Diamond Jubilee, and announcements everywhere of festivities and local events in honor of the event. 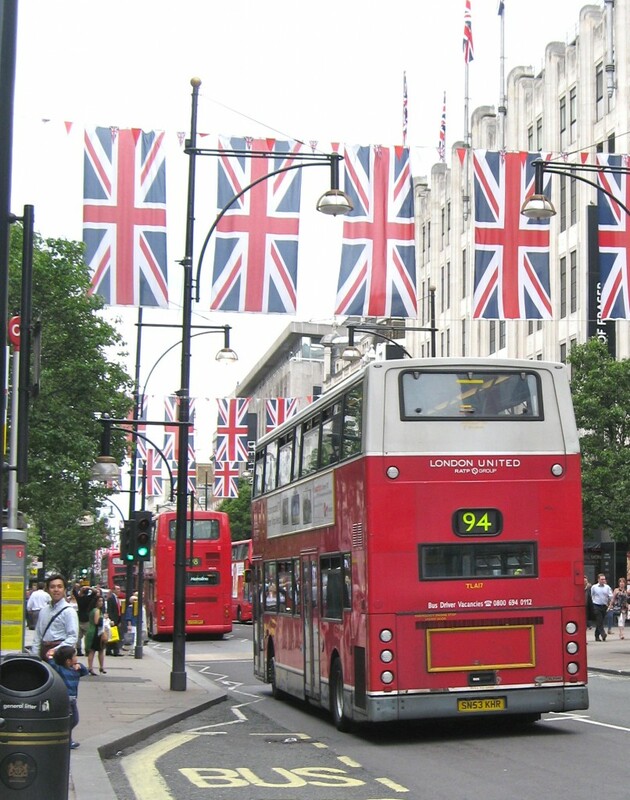 There is a great sense of celebration everywhere, from the smallest village to London’s high street. You really can feel it building, and the sense of national pride and just plain fun is in every corner of the country. This weekend should be a kick! Happy Diamond Jubilee Your Majesty. Photo by me. I have thought more than once what a great sense of community the monarchy brings, and whenever I hear people wonder why the British keep it, this makes it perfectly obvious. At the moment it is at the height of popularity and seems to pull the entire country together. The deep awareness of history and common past has never shown its strength in a more obvious way. Most Brits have never known a different monarch in their lifetime when you consider this celebrates Elizabeth’s 60th year. 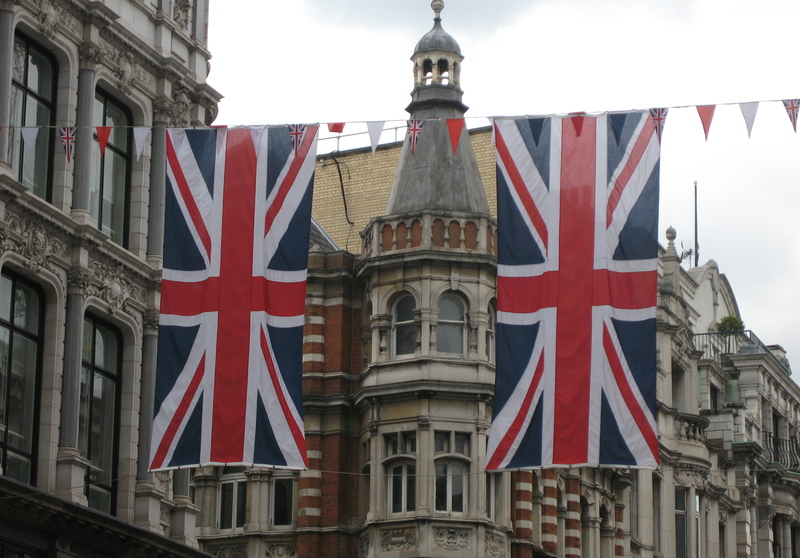 So though we Americans may go through many heads of state in our lifetime, the monarchy gives the British people a great sense of continuity and national pride. Windows for the celebration. 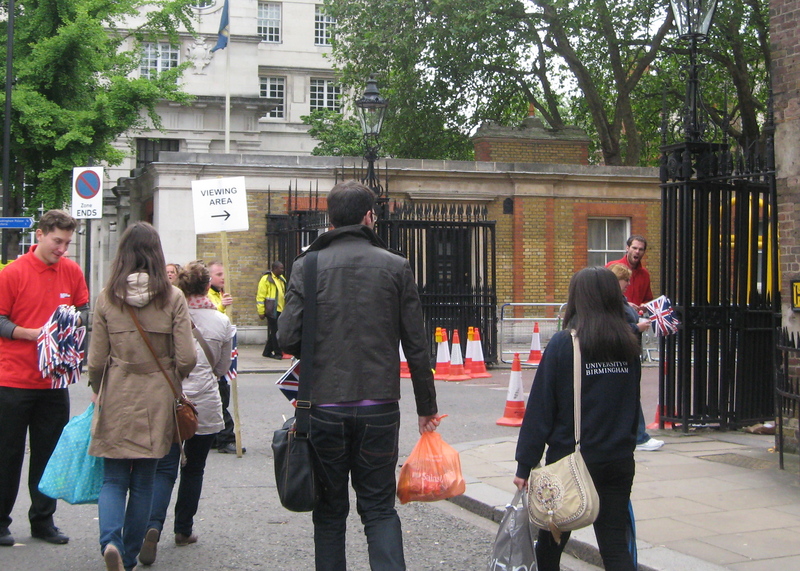 Hard to see, but Will and Kate are on the left. The celebration is focusing on the accession. Photo by me. There are all sorts of street parties and local celebrations planned, from pony rides to special fairs, and just about everyone seems to be getting in to the spirit. Of course a four day holiday weekend does help bring joy to the nation. Even the bakeries are getting in to the spirit. Photo by me. It’s been great fun to be around for it, and I head in to London on today to join in the main festivities. February 6th marks 60 years to the day since Queen Elizabeth II ascended Britain’s throne. 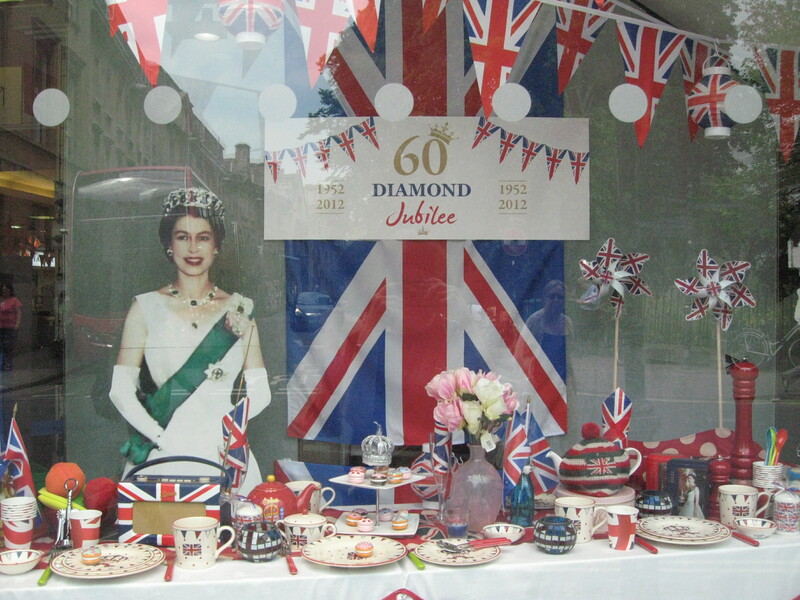 The Diamond Jubilee Celebrations start this weekend and continue for 5 months. There is a wonderful display of photos courtesy of The National Post. Click here to view the entire sequence. 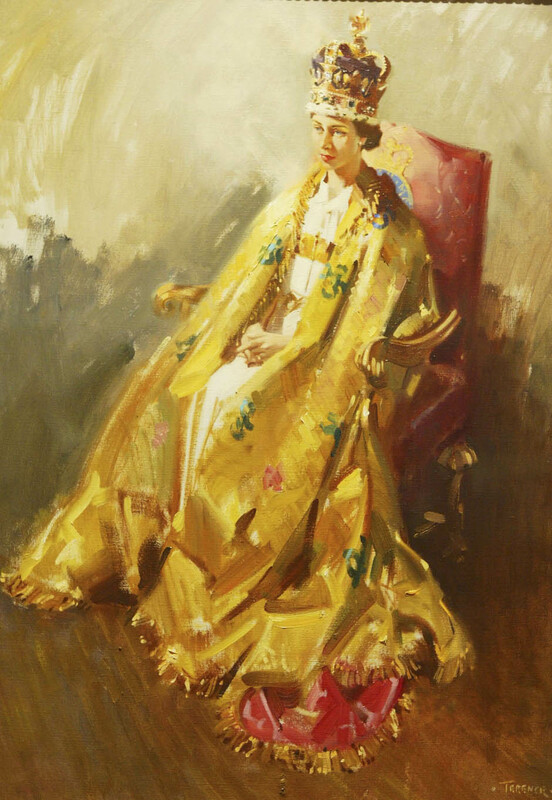 A portrait of the Queen on her Coronation Day 1953 by Sir Terence Cuneo. Photo from The National Post article. My Beloved Brit has just tried to book me a room in London for the weekend of June 2nd so I can participate in the highlights of the celebration while he is off sailing with his mates. I do love that man! Keep your fingers crossed that London is not totally booked up already.